This blog post has been a long time coming. I’ve sat down at my laptop several times in an attempt to get the words out, but they simply wouldn’t flow. Even though all the feelings were there, I couldn’t get them into phrases and coherent thoughts. I read the words over and over again as things started to come together in my head. It was finally time to write. So I snuck out of bed as quietly as I could (under the sleepy eyes-half-open gaze of our cat Jake), heated up some leftover coffee from this morning and started typing. You see, this quote by Helen Keller completely validated how I’ve been feeling over the past months. I don’t want to get into an “I’m-so-busy-here’s-a-laundry-list-of-all-the-things-I-have-to-do” type of post, because let’s face it…we’re ALL busy! From the stay at home Mom raising three beautiful babies to the CEO of a major corporation. All of us have duties and responsibilities that need to be balanced with personal health and relationships with those we love. So instead, I’ll summarize and say that I’ve been struggling to balance it all. I’ve missed family get togethers, walks after dinner in the Fall air and instead have had a steady diet of knock out days of furniture painting, running here and there on endless errands and constant checking of my calendar to see when I can squeeze in one more thing. This has been the pace of running my business, and when you’re starting off small, it’s definitely a grind. There aren’t many days off and even if you’re not physically working on projects, your mind is making to-do lists for the next day. “Jenn…you’re working way too hard. Just take a break and give yourself time to relax. Take things off your schedule. But for the sake of being authentic and honest, this does NOT come easy to me. I’m a do’er and I always have been. I was raised to be responsible. My entire family is a clan of do’ers. There’s pride in a hard day’s work and that’s difficult to pull back from when you’ve been doing it for 30 some years. Over time, I have come to realize that the problem with that mindset is that my sense of worth and accomplishment is all tangled up with my productivity and performance. I feel good about myself when I get a lot done and conversely, I feel like I’ve been lazy or wasteful of my time when I relax for a few hours watching Netflix, no matter how badly I need it. I feel amazing when a piece of furniture sells and doubt myself and my skills when pieces sit for longer. This all led to me pretty much burning myself out and running on fumes in a tangle of emotions and tears. I’m working through it all, recovering and getting back to a more manageable pace. Marc and I have been going over my calendar to see where I can pull back and gain more time. I’ve been saying “no” much more often. Some weeks are busier than others and I have to use every free moment to squeeze in a furniture makeover to have ready when one sells. Other weeks are a more open and I can breathe easier and have that catch-up cup of coffee with a friend. I’m also trying to recognize those times when I feel guilty for relaxing and taking a break and remind myself that rest is a good thing and that where I’m at is okay. I’ve also been trying to maintain the pace of creating at home and selling in two different retail locations. There’s a lot of back-and-forth on my end and taking items in and out countless times to keep my spaces looking fresh. Some days, I wish I could have my own shop so that I can work and sell in the same space. Having everything in one location would be much more convenient, but that comes at a price. There are so many other considerations to think through with owning your own shop and I know I’m not ready for it. I’ve also been kicking around the thought of keeping my retail spaces but moving out of the house into an external studio where I can film tutorial videos and spread out a bit more. There’s also thoughts of getting rid of a brick-and-mortar presence completely in favor of an online shop. Oh guys, there’s so many thoughts and no matter how far my mind wanders down each option, I wind up at the same place – I’m not ready yet. Now is definitely not the time to make major shifts in my current business model, but perhaps 2019 might bring some much-needed efficiency to the whole Eight Hundred Furniture operation. I’m having a new website built and it’s coming along nicely. It’s much faster than this one and will have room for me to grow as I create more content. It will load easier for the reader and have e-commerce capability. It’s taking a bit of time, as I have over 4 years of content to migrate over to the new platform, hundreds of images and a new layout to think through. So any plans of growth are on hold until the website is up and running. As I work through all of these possibilities and options, I get so frustrated and I tell myself that I should be further along in the process. I should have this all figured out. I should be working smarter, not harder. That’s why this quote spoke to me so much. It finally dawned on me that I’m simply walking through the business building process. Do you know what I mean? The reason why I’m struggling is because I’m figuring it all out. There aren’t any shortcuts when it comes to growing a business. I’m putting in my time. I’m literally growing something from nothing. I’m putting systems and processes in place that don’t exist. I’m building something from the ground up. I’m taking photos and building a library of images with my creations as the content. I’m growing a following on social media and building that community one person at a time. My bankroll is growing one sale at a time. It’s a steady trickle. A little here, a little there. One piece at a time. And there are no shortcuts to moving through that process, as much as I’d like there to be. This does not happen overnight or over the course of a few months. You have to walk it out and go through the stages of birthing a business. It’s touch and go most of the days and I’m still acclimating to the ebb and flow of a small business. (This girl loves predictability!) I’m navigating a world to which there is no guidebook or owner’s manual. You sort it out as you go, adjusting all along the way. If your heart is right there with mine, then here’s a hug. If you’ve been struggling in the process, I’m right there with you. 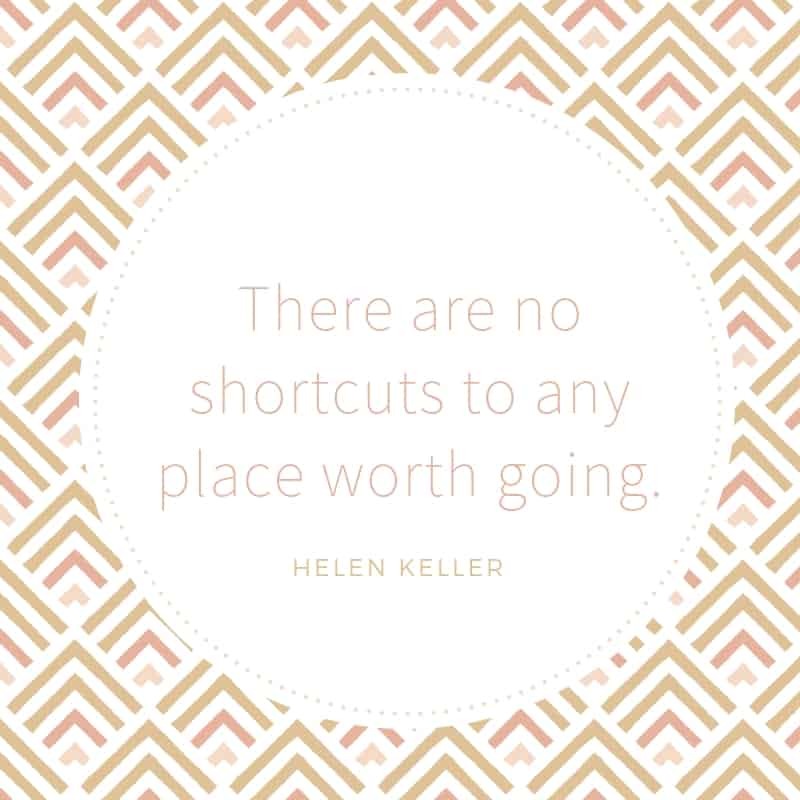 There are no shortcuts to any place worth going. You have to walk the journey – ups and downs, turns and straightaways, watered meadows and dry deserts. So let’s do it together, shall we?